When looking for goat milk recipes, the first thing to remember is that goat milk is, well...milk. 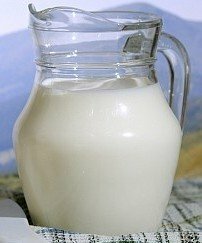 So, if you're new to goat milk and wondering what to do with that gallon or so in your refrigerator, start by asking yourself, "What would I do if it were cow's milk?" Pour it on cereal, make puddings, sauces, cakes or hot chocolate, or drink it plain. Goat milk can be used in any way you would traditionally use cow's milk. If that's the case, you may be thinking, "Then what's the big deal about having recipes dedicated to goat milk?". Recipes that traditionally call for goat milk are those that have benefited from the several properties of goat milk that do differentiate it in taste and texture from cow's milk. Used cold, properly processed goat milk is practically indistinguishable in taste from cow's milk. When heated or otherwise processed (as for cheese), however, the three "goat" fatty acids lend an undeniable tang to food. Some people have an immediate liking for the flavor of goat milk products, while for others, it is an acquired taste. Goats milk recipes are traditionally associated with desserts. This is because the more even distribution of the smaller fat molecules in goat milk gives a creamy smoothness to all foods made from it. This difference in texture is even evident from drinking the milk by itself. So, ice cream, fudges and other sweets that are known for that "melt-in-your-mouth" feel all benefit from the extra rich smoothness of goat milk. However, all recipes can benefit from the nutritional benefits of goat milk! To learn more, read Goat Milk Nutrition Facts. Do you have a recipe using goat milk that you'd like to share? 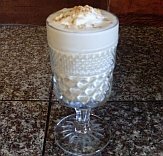 You can submit your goat milk recipe and view other visitor-submitted recipes. Recipes will appear on the web site, and may be chosen to appear in the monthly newsletter. And, if you want to go beyond goat milk products, check out MissHomemade.com for a huge selection of mouth-watering, one-of-a-kind homemade recipes. MissHomemade.com not only tells you how to make great dishes, she also tells you how to make the ingredients for the dishes to save you tons of money! Recipes that require cooking the milk, either on top of the stove, or by baking with other ingredients, are a good way to use that canned goat milk you made during milking season. Canned milk has a slightly cooked taste to it, which makes it less appealing for drinking and using with fresh food recipes. However, you'll never notice the difference when using it for cooked recipes. That way,you can save your fresh milk for drinking and goat cheese making, or creating other delicious goat milk products! Powdered or evaporated goat milk can also be used in some recipes. If the recipe calls for goat milk, reconstitute the powdered or evaporated milk as directed on the can, and use the amount given in the recipe. Now, get ready to enjoy the mouth-watering taste of these excellent goat milk recipes! A delicious dessert caramel with Mexican origins, this recipe is easy to make — and easy to make disappear! Everybody loves fudge! Choose from chocolate pecan, peanut butter-maple or white fudge. This goat milk recipe uses three forms of goat milk to make a delightfully smooth flan with just the right touch of sweetness. Cold, sweet and delicious, this milkshake made with goat milk tastes like you're drinking a pie! Mexican candy with a sweet citrus flavor and crunchy pecans will be a hit with your family or friends. Surprise your family with an elegant goat cheese souffle that's easy to make. The combination of savory herbs, goat milk and delicious goat cheese makes this souffle a delightful addition to any meal. Don't forget to view our collection of delicious homemade ice cream recipes. After all, there's no "cooler" dish than goat milk ice cream! Do you have a great Goat Milk Recipe to share? Articles are updated frequently, so check back here for any new information related to goat milk recipes!